On writing a first article, my first thought would be where to start? In fact, the answer to that was easy – as the Mad Hatter says; “Start at the beginning and go on until you reach the end. And then, stop.” I started at the beginning – I went back to my North-Easterly roots and re-visited the first gallery I ever stepped in: The Baltic Centre for Contemporary Art in Gateshead. Ok, so it’s not that close to home I admit – a good 48 miles in fact, but it is the closest major art gallery to my mainly-unnoticed home town of Colburn, Catterick, and I visited it so often during my A-levels and Foundation that being there still inspired that warm fuzzy feeling of nostalgia connected with home. And what better exhibition to compliment this nostalgia than “Learning to Love You More (16th January – 8th March 2009)”, a participatory exhibition organised in collaboration with Middlesbrough artist Nicky Peacock. “Learning to Love You More” comprising of a series of public responses to assignments given by Miranda July and Harrell Fletcher, for example; “Recreate an object from someone’s past”, “Make a paper replica of your bed”, or “Take a picture of strangers holding hands”. Visitors to the gallery were invited to choose an assignment to complete for themselves and were provided with materials in order to do so – therefore the exhibition was ever-growing and changing as time went on. The exhibition in the Baltic picked up where it left off in Peacock’s home town of Middlesbrough, selecting works which compliment the “Yoko Ono” and “Fluxus exhibitions”. The way the works were displayed had Peacock’s homely style written all over it, with the walls painted in bright colours, like someone’s bedroom or living room, and many of the works displayed in small picture frames, or made from domestic materials, such as textiles or found objects. 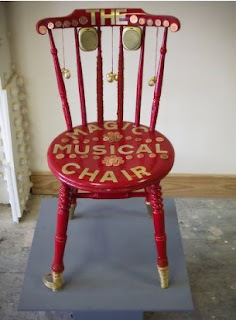 One of my favourite pieces was “The Magical Musical Chair”, an ordinary wooden kitchen chair, painted red with various decoration using pennies and gold paint, and with speakers attached out of which music was playing. What I like about this exhibition was its accessibility; one of the dangers of being a practicing fine artist is that no matter how hard you try to be unpretentious, you will still probably never produce work that will be enjoyed by both someone’s young brother and someone’s nana, while still being interesting to regular gallery-goers, but this is something that this exhibition seemed to achieve. It suggested that art is not this mysterious concept that not everyone can understand, but that it is approachable and enjoyable and that anyone can take part. It was also inspiring to see how creatively each person – whoever they might be – had carried out these assignments, making each work unique even if they were part of the same brief. I definitely came away wanting to try one of the assignments myself.